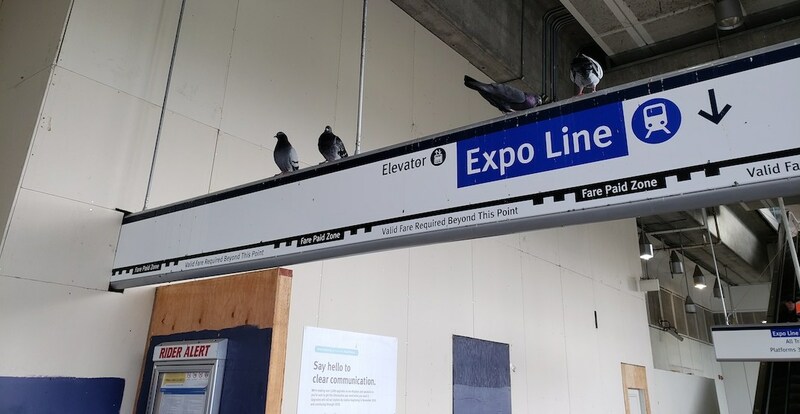 Frequent transit riders will know that the pigeon infestation at some SkyTrain stations, particularly Commercial-Broadway Station, has gotten completely out of hand. That is why TransLink is launching a new pilot project — in partnership with the BC SPCA — in an attempt to control the pigeon population. The solution: giving pigeons birth control. An automatic bird feeder installed at VCC-Clark Station dispenses OvoControl, a non-toxic, effective and humane contraception used in other cities around the world to prevent pigeon reproduction and reduce populations naturally through attrition. Pigeons eating the bait pellets on a regular basis will not be able to fertilize eggs. According to TransLink, studies have shown a 50% to 90% pigeon population reduction through the use of OvoControl. “OvoControl has been approved for use by Health Canada and only has contraceptive effects in birds,” said Dr. Sara Dubois, Chief Scientific Officer with the BC SPCA, in a statement. The pigeon-control measures using drugs are supported by both the Wildlife Rescue Association and the Vancouver Humane Society. But in order for this pilot project to prove its effectiveness, TransLink is urging transit riders and other members of the public to stop feeding the birds. Food sources located elsewhere will encourage birds to roost inside the stations and potentially draw pigeons away from the contraceptive pellets. To date, other pigeon-control measures by the public transit authority include the installation of netting at stations to stop birds from reaching into empty spaces, and spikes and strips to deter pigeons from roosting on flat overhead surfaces. For the pigeon problem at Commercial-Broadway Station’s new platform, TransLink even hired a falconer to deter the birds. The new pigeon-control measure highlights the seriousness of the pigeon problem at SkyTrain stations. Not only is it a cleaning issue, pigeon droppings are a health hazard; these birds can potentially carry a multitude of illnesses that can be transmitted through airborne particles, according to the World Health Organization. Moreover, on the SkyTrain system, pigeons can trigger track intrusion alarms, which causes the driverless trains to engage their emergency brakes automatically. Such hard stops of a moving train can lead to passenger injuries and service delays.